What do you think are the worst two territories you can get on the Small Earth Auto Dist template? Switch Alaska for Japan, that seems worse. Takes 4 turns to grab your first bonus then vs 3 turns. You'll never get two starts in the same bonus, that is impossible. If you get any of the worst Asia spots with any of the worst North America spots, you may as well surrender, your opponent can't fail that badly if they're half decent. And exactly for that reason Small Earth Auto-distribution is crap. It is really annoying, that it is part of QM. I really don't get the point of these settings. I actually had a ton of fun playing this game. I didn't mean for my thread to sound negative, I just find it a fun topic to think about. I disagree. I suspect it's possible to win from any two territories. Remember, your opponent doesn't know you had bad starts and may not play aggressively. Use this to your advantage. It's OK if you don't like it, that's why QM allows you to uncheck it. But I actually enjoy it a lot! Sure, you'll lose 10% of your games due to starts, but you'll also win an equal percentage of games due to them. The other 80% of the games are determined by skill. It all evens out in the end. In this game, I actually won by taking North America. North America is really strong if you can get it, it's just so hard to get as your first bonus. Stop downvoting opinions you don't like with your tools! You can pick that template, as you are the admin, but it is crap through my eyes! Against a decent opponents 80% of the games are determined by starting positions. Just as it is the 1st template and you can farm noobs, it does not mean, that it is a skillbased template. It can be fun (as it is that simple), but it is a bad choice to start with such templates in QM. In fact, in autodistribution like the one Fizzer shown, one is in advantage if he has adjacent starting positions (there is no need to push in all directions as starting positiona actually back each other) as he can keep pushing forward. If it is about Alaska and Madagascar/South Africa as start, you need to find SAmerica open to be able to do anything. Back in the day SE auto distri still used 1 army must stand guard i got Alaska/Kazakhstan and my opponent got Madagascar/Iceland and I just fully moved to Middle East on turn 1 and he surrendered, if we kept playing it might have become like 50 turn games or such just cause i had such a positional advantage but totally no income to take and same basically the other way around with my opponent since he couldn't take bonusses or if he managed to take Europe i would have directly a stack on a double border. I don't really like the auto distribution due to the automatic loss of games cause of the bad starts although change from 1 army must stand guard on to off has made Europe actually a 2 turn bonus as well if you start in 5/7 territories. I'll let it be known, you're not alone. Small Earth is one of my favorite maps, and auto distribution is by far the most acceptable form of RNG for me in WarLight - definetely more than WR or a cancerous luck modifier. I haven't played it in a while and definetely didn't touch it during the Quickmatch era, but I recall having started in Mongolia and Alaska. I have had similar starts as Fizzer here, with a different NA start, and Yakutsk. Going for NA also won me that game. In theory, getting Japan there would lead to the same result. Furthermore, I don't think my opponent even made any bad moves. In fact, I would not even have tried to counter NA if I was in his place. Ultimately "What do you think are the worst two territories you can get on the Small Earth Auto Dist template?" really deepends on what two territories your opponent gets, and how they play from there. I think your opponent should have stopped expanding. Once he had intel that Europe is clean, he should just have retreated armies from Africa. The double attack was also bad. Asia is worst expand in the map. 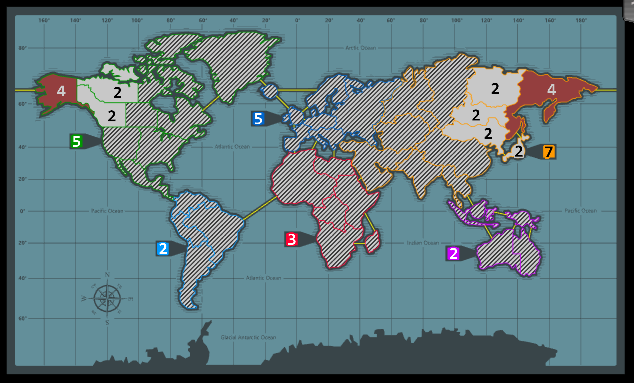 Looking back at your game TBest i would argue that most strong players would have both their bonusses at the end of turn 2 as well as attacked North Africa most likely and if you would do that you probably would come to the conclusion that your opponent is neither in Africa nor Europe meaning there are only 2 options left for him to be in. With that in mind i would go fully in on North America to prevent my opponent from taking it during the 3rd turn. If he would take Europe at that point cause he had the unlucky Iceland start you will still have the double border on it and a good way to backstab him possibly at that point as well. Iceland/Japan would be much worse imo. Still 3 turns until you can get a bonus, and Europe is way harder to hold than NA. At least here you can theoretically take NA and have a chance to win the game.